After an amazing trip thru Doubtful Sound, New Zealand, the next stop was to be in Bluff, just south of Invercargill. This would be my jumping off spot to get over to Stewart Island. Everybody I talked to, and everything I had read, told me that this would be my best shot of seeing a Kiwi in the wild. Up to this point, the weather had been just about perfect, but Mother Nature had some special plans for my arrival on the southern tip of New Zealand. After getting checked into the RV park in Bluff, I was off to make a Ferry reservation and check on the weather. I probably should have done that in reverse order, as after paying for my round trip ferry ticket, I got the forecast. Low clouds, periods of heavy rain, and gusts up to 80 KM. The ferry is a very nice powered catamaran, that moves right along at 18-20 knots, but in 3-4 meter seas, that will make for a pretty bumpy ride. The very nice retired lady sitting next to me, was pretty uncomfortable. She was carefully following directions of a friend, who told her to sit in the back of the boat, and immediately go get a gin and tonic, and all will be just fine. She did, and it was! I had reserved a room in one of the local, historic homes, and it was truly lovely. The island is not really all that big, and can be walked just about anywhere you need to go, but they provided me with a ride from the ferry and down to the small Ulva Island ferry the next morning. 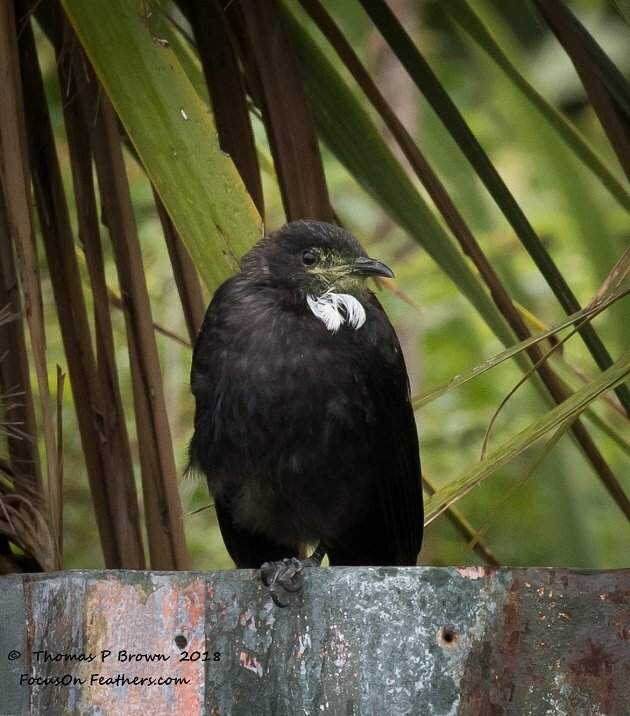 Ulva island is a small island, adjacent to Stewart, where the Department of Conservation has made a herculean effort to remove all the mammalian predators that are literally wiping many New Zealand birds right off the planet. 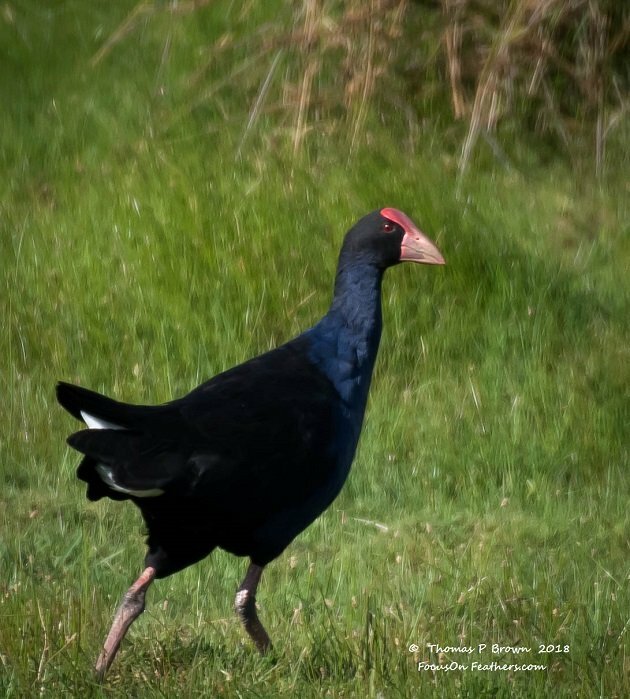 Imported rats, Short-tailed Weasels, or Stoats as they are know as here, 0possums, and feral cats have caused the extinction of literally dozens of bird species here in New Zealand. Prior to recent man’s arrival on the islands, there was not a single predator to be found. A large number of birds here were, or became flightless, as the was no need to fly away from anything. All these newly introduced vermin had a field day. 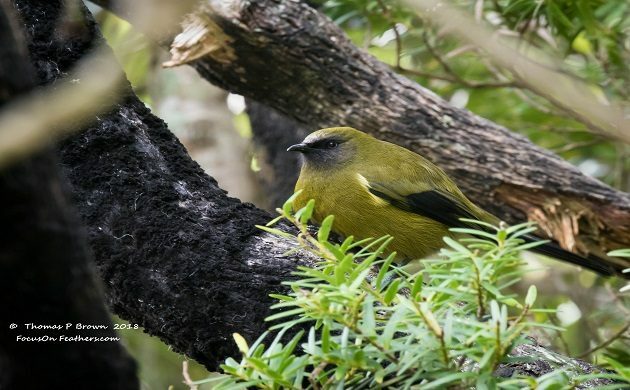 Ulva Island is one of many New Zealand islands that the DOC has worked very hard to remove all the pests, and re-introduce many of the endangered species. 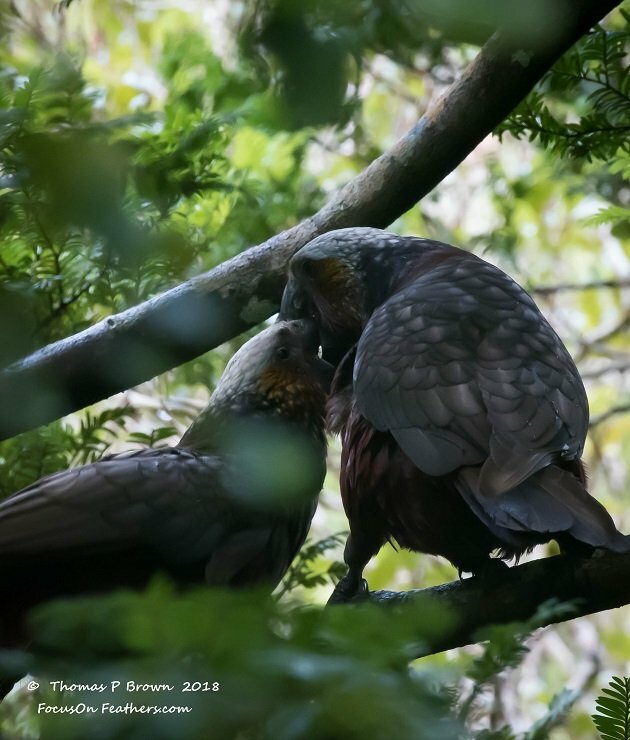 The system seems to be working, as a large number of birds have been brought back from the very brink of extinction, to thriving where ever these introduced predators are removed. Ok, enough chit-chat, how about the birds? I was able to spend nearly an entire day on Ulva, and had just about every possible weather while I was there. Rain, wind, fog, brief sunshine, and at 9:30 a heavy hail storm blew thru turning some parts of the very well maintained trail system white. It was just a few minutes later, when very much to my surprise, a Southern Brown Kiwi, jumped out of the bush, ran down the trail, and then disappeared just as quickly. There was no time to get a photo, but the German tourist right behind me at the time might have more excited than I was. 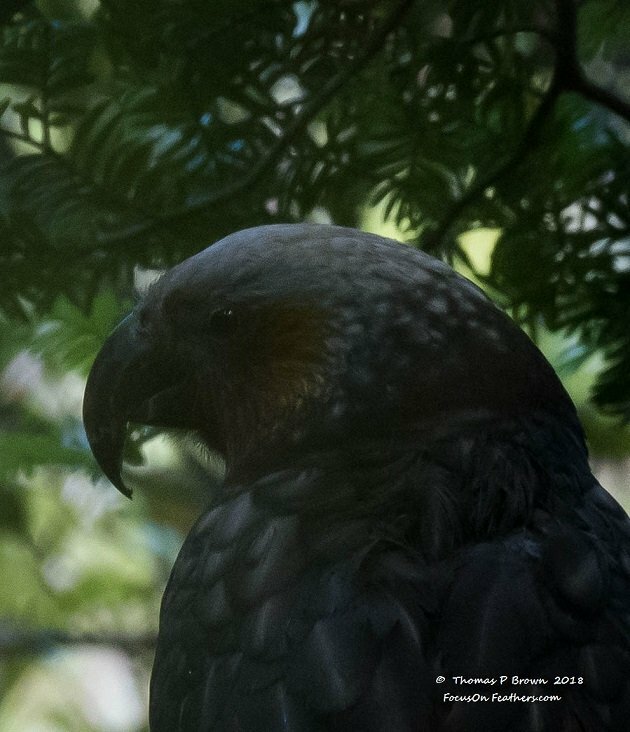 The second great spotting was the local Kaka, a parrot that is an endemic to the South Island. In fact, I saw 4 of them, all quite busy with something of a mating game. 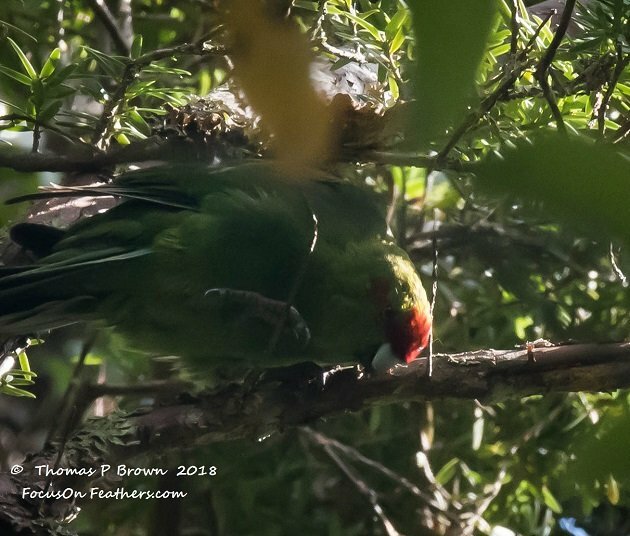 The one where the male bird bites the female in the top of her head, with his incredibly sharp bill. Here is a good look at that bill. The rest of the day brought me New Zealand Wood Pigeon, Brown Creeper, Gray Warbler, South Island Saddleback, Red-crowned Parakeet, Several Tui’s, Weka’s, Bellbirds (on the cover photo), and South Island Robins. On the ferry back to Stewart, there were Buller’s and White-capped Mollymawks, as well as South Island and Variable Oystercatchers. Not a great photo of the Red-crowned Parakeet, but the weather didn’t help out much. 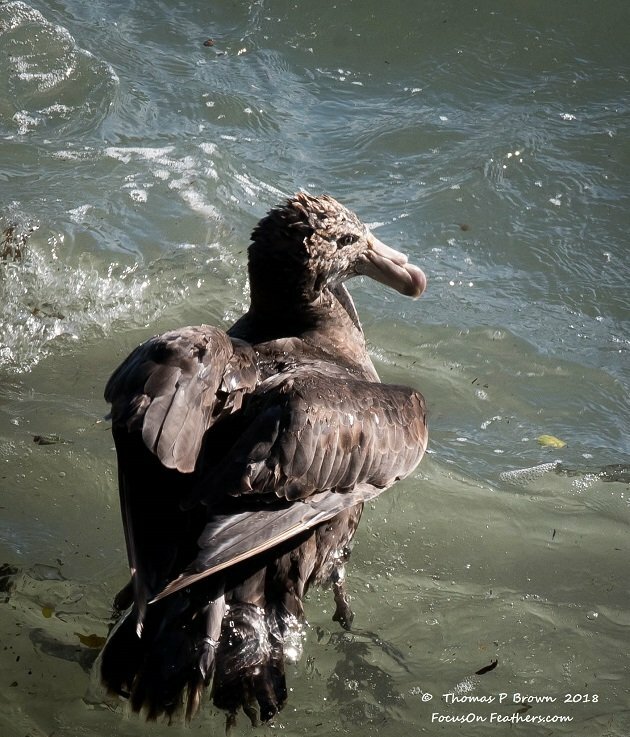 Our next stops were at Portobello, for the Royal Albatross Center, and the Blue Penguin beach. 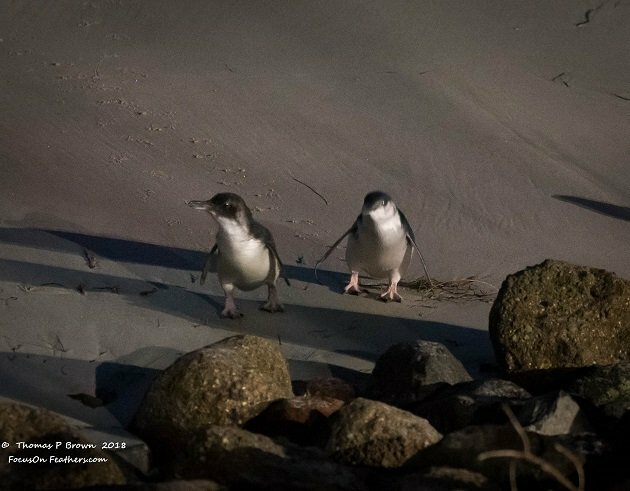 The first night we got to watch nearly 20 Little Blue Penguins waddle ashore, as well as a whole bunch of the huge Northern Royal Albatross’s circle overhead. We had planned on an early morning visit back to see the albatross’s but it was blowing well over 50 knots, and it was just crazy trying to be up on that point in that kind of wind. Here are a couple of those Blue Penguins. 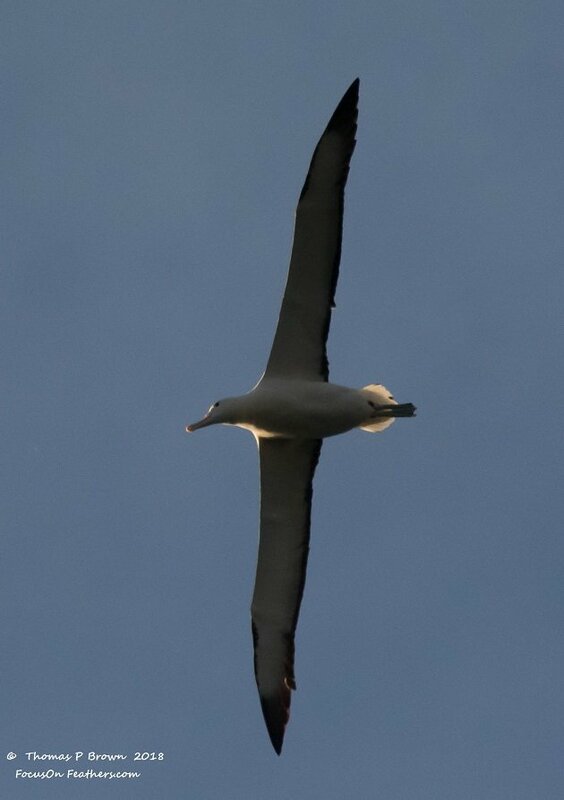 And a quick grab shot of the Northern Royal Albatross, with their 120 inch wing span. 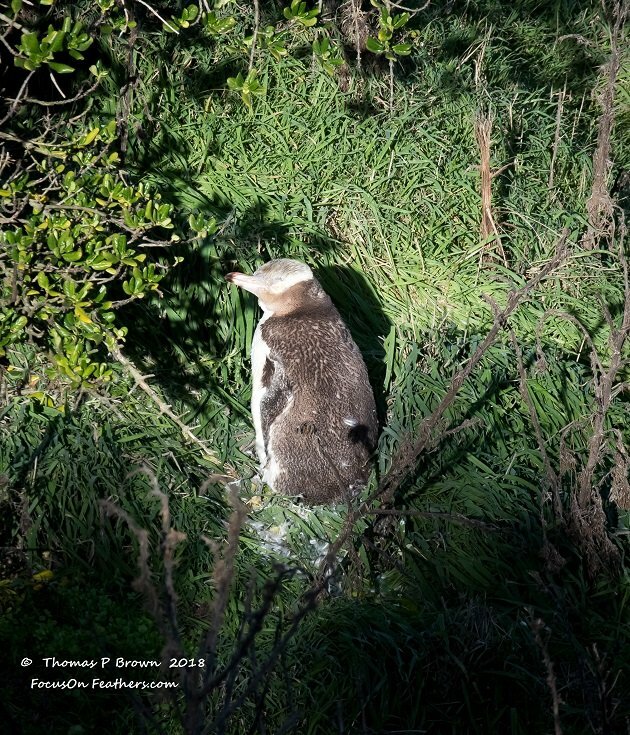 Then we wrapped up the week at Moreaki, where I got to see several of the Yellow-eyed Penguins come ashore. It is pretty amazing how that big a bird can just all of the sudden be there, 40-60 feet above the water. They just appear almost from now where. This one just all of the sudden was right across from me. And I was able to sneak up on this one, to get above it while it got ready to settle in for the night. There were also a bunch of lunch stops, wayside points that looked good, and some of those, “Look! I think that is a Spotted Shag stops”, that added the afore mentioned Spotted Shag, European Greenfinch, Peafowl, Pied Stilts, Purple Gallinules, and a Northern Giant Petrel. Now we are off to view the Franz Joseph and Fox Glaciers, as well as a stop in Okarito Lagoon, Greymouth Estuary, and the Marlborough Sound. That has the Year List at 267, 71 for the month of March, 63 new Life List birds! I found this Sacred Flycatcher down on the beach at Bluff. A popular New Zealand Favorite, the Tui was a lot more difficult to get a photo of than I had expected. 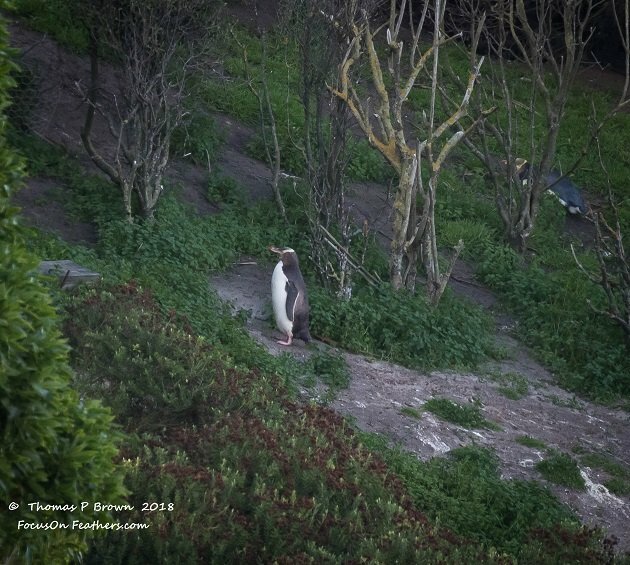 I found this Northern Giant Petrel below the cliffs where I was looking for the Yellow-eyed Penguins. A complete surprise. Tom Brown grew up in the high desert area of central Oregon. His love for birds and photography started at a young age. Thru the course of time, travel, and a lot of different occupations, he ended up living in Seattle, and met a girl with a sailboat. Now his wife, Jeanne wanted to travel the world, and he thought that sounded like fun, and a great way to see a bunch of new birds! So far they have sailed north from Seattle, up thru British Columbia, Canada and down the West Coast of the US to settle (for now) in La Paz, Mexico. 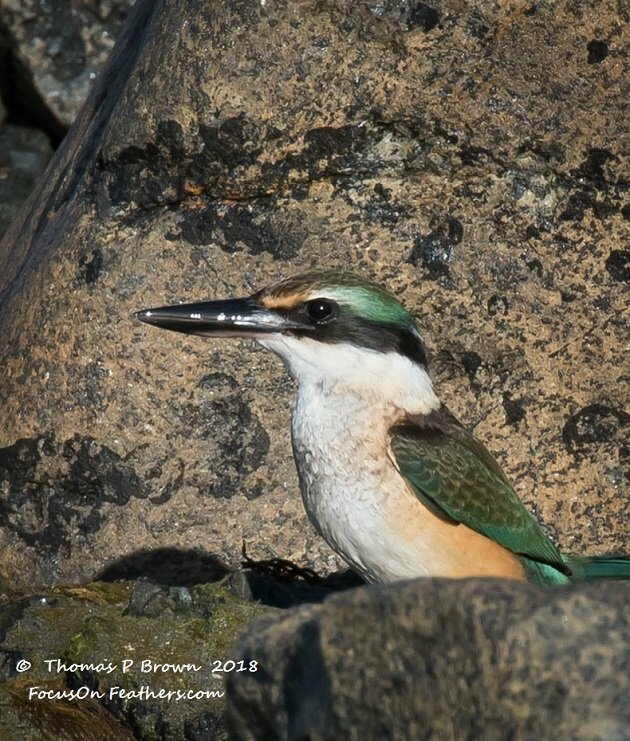 When he is not scouring whatever area they are in, looking for the next great bird photo, he can be found trying to earn enough money for the next adventure, and of course, a new lens or camera body! Having been nick-named “The Bird Nerd” by his last remaining friends and family, Tom continues search for that next lifer, and the accompanying photo that goes with it.